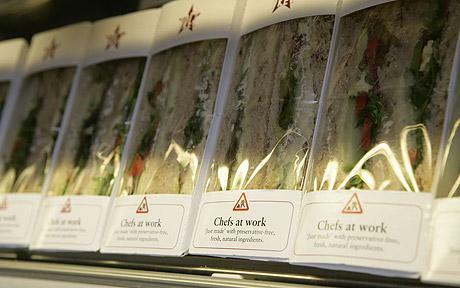 Julian Metcalfe, the chain’s co-founder, has removed tuna and cucumber sandwiches, while he has also banned endangered bluefin tuna from sushi boxes sold at Pret and its sister outlet Itsu. His ban comes after watching environmental documentary The End of the Line, which describes how modern fishing is destroying the oceans’ ecosystems. He continued: “We no longer sell the tuna and cucumber sandwich at Pret. We do an Alaskan salmon, which is sustainable. Both my companies will do everything they can to speed up the process by which we only buy sustainable fish. Pret’s ban comes as celebrities such as Elle Macpherson and Stephen Fry condemned Michelin-starred Japanese restaurant Nobu, for serving bluefin tuna. Following the release of the documentary, a number of celebrities including Jemima Khan, Sting and Charlize Theron wrote to the eatery, partly owned by Robert de Niro, and said they could no longer “dine with a clear conscience” as long as the restaurant continued to serve the fish, a species considered to be as endangered as the panda or tiger. Celebrity chefs including Gordon Ramsay have also imposed bans on bluefin tuna at their restaurants.